With the rainy weather plaguing Baton Rouge these past few weeks, it can be hard to believe that summer is finally here. But then, when we least expect it, the clouds part and the sun comes beaming through. It’s pool time. Why should you spend those precious, sunlit hours deep-cleaning an algae-ridden pool? 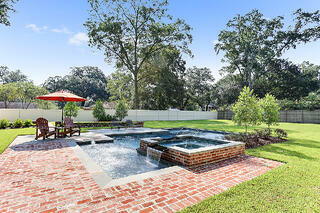 Keep your pool maintained all summer-long in Baton Rouge with these 6 pool maintenance tips. Debris management: The first step in having a clean pool is removing any organic debris (leaves, sticks, etc.) from the pool. The pool skimmers should be emptied every few days. The strainer basket on the filter pump should be emptied at least one time each week. If the pool has a Polaris Cleaner, the bag should be emptied every other day to remove debris. You can remove floating debris using a net, while a vacuum will be needed for any sediment that settles to the bottom of the pool. Swimming pools need to be brushed weekly. The deck surrounding the pool should be blown off as needed, but especially after storms to remove debris that may fall into the pool. Leaves are acidic and can change the pH balance of the pool water, as well as cause major staining on pool plaster surfaces. Water Balance: Water balance is incredibly important for the water’s sanitation, the pool’s plaster and tile’s appearance, and the overall longevity of the pool. Whether you have a salt water (chlorine) pool or a purely chlorine pool, water balance is always important. Test strips are often inaccurate, so we recommend using a Taylor K-2006 FAS-DPD test kit. Whether your pool is chlorine or salt, it should be tested for chlorine, pH, alkalinity, and copper on a weekly basis. If your pool water is unbalanced, you will not only have problems properly sanitizing your pool, but the pool’s plaster and longevity will also be compromised. Adjust Chemicals: In order to adjust the chemical balance of your pool, you must know the gallon amount of your pool. Please read the directions on all chemical labels and use extreme caution while handling chemicals. Store all chemicals in a dry place that children & pets cannot access. For pointers on balancing your pool’s chemicals, you can talk to one of our trained and certified pool maintenance technicians. Filtration: Proper filtration is crucial for your pool’s longevity. Whether it’s sand-, cartridge-, or DE-based, it’s very important to watch and record your filter gauge’s reading. Sand filters should be backwashed and rinsed weekly. Cartridge filters have four cartridges that must be taken out and cleaned thoroughly. DE filters will need to be backwashed & rinsed three times before adding the appropriate amount of required DE powder to the skimmer. Water Level & Leak Repair: Your pool’s water level should remain in the middle of the skimmer opening at all times. If the level is too high or too low, your pool water will not filter properly, which can also cause damage to the pumps and filter. The pump equipment should be inspected weekly for any leaks that need repair. Consult a professional cleaning service: Pool maintenance is a monthly, weekly, and daily commitment. And that can become overwhelming. With the help of a professional pool maintenance company, the only commitment you’ll have is enjoying your pool. The trained and certified pool operators at Lucas Firmin Pools are here to make sure you stay committed to enjoying your Baton Rouge summer. Call today or visit our website to learn more about our pool maintenance packages.